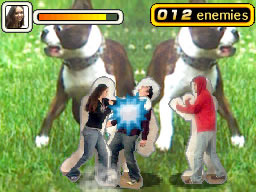 Use the Nintendo DSi Camera to take photos of a person in several poses, record their voice and then send them in to fight against other players. You can save up to eight fighters to play as, each with a range of attacks and special moves. In the VS. mode, two players can pitch their fighters against each other, while in the Solo mode you have to take out 100 enemies in a row.